If you are new to The Only City Left and want a quick catch-up, you can read a synopsis of Parts 1-34 and then start at Part 35. You can reach an individual part of the story by browsing the Table of Contents. At the end of Part 41, Allin took advantage of the perfect recreation of suburbia by stealing a car. While he tried to figure out how to make it go, Tumble released the emergency brake and Allin ended up bursting the car through the closed garage door. The skeletons didn’t stand a chance. I plunged the car straight into their ranks and scattered their bones in a wave of calcified shards, then braked to a skidding stop in the middle of the street. “Did you see that?” I whooped. Not bad for my first time behind the wheel! “Do you see that?” Guppy countered, pointing to the clinker marching toward us. “Go! So I went, swerving the car wildly as I figured out exactly how much I needed to steer and accelerate to stay in control. My rookie mistakes worked in our favor, though, as I crashed into many a hapless skeleton as I got used to driving. “Allin, he’s catching up,” Tumble informed me calmly. I looked into the mirror attached to the front window and saw the clinker running behind the car. Sure enough, he was closing the gap. I blinked and he disappeared from view. The car shook under the impact of something hitting the roof. A second later, the upside-down, leering face of the clinker slid into view before me. “Please drive more carefully. This is a vintage vehicle,” it said as it brought one of its fists down against the window. Spider-web cracks radiated out from the impact, fracturing my view through it. I braked hard and the clinker flew forward, but it twisted in mid-air and grabbed the car’s hood, tearing into it like ripe fruit. Then it launched itself toward us and head-butted the front window, finishing the job it had started. Guppy screamed and I winced against the shower of broken glass, but Tumble remained calm and loosed a series of blasts from his gun straight into the clinker’s torso. The first shot stripped the stitched flesh from its frame, the second pushed it back a bit, and the third sent it reeling. It tried to keep its hold on the hood but only managed to tear a strip off as it flew backwards. It landed on its feet and cast the ragged strip aside. “That was not very neighborly of you,” it said in a condescending tone, picking torn flesh off of its body. “Still using it, thanks,” I said, and floored it. The clinker sidestepped, but not fast enough. I guess it only had itself to blame for providing me with such a nimble car. I clipped it and sent it sprawling to one side, but a check of the side mirror showed that it was immediately on its feet and back in pursuit. One leap and it would be on us again. “Tumble, can you buy us some time?” I yelled over the rushing wind. “Five shots’ worth, that’s all I have left” he replied. He climbed into the empty window and leaned out of the car, his poncho whipping around in the wind. In the mirror, I saw the clinker leap to one side to avoid his first shot. I cheered. Anything we could do to slow that relentless robot down helped. I jerked the wheel to the right to adjust to Guppy’s quick direction change, and Tumble nearly lost his grip on the window frame. “Sorry!” Guppy and I both yelled. Guppy roared and smacked at its face with his purloined skull. The clinker brought one of its extra arms up and smashed the skull to pieces, then shot another arm forward. Guppy turned sideways and plastered himself against the side window, and the clinker’s deadly arm buried itself in the seat in an explosion of foam stuffing. Tumble fought off another clinker arm with his gun held sideways before him like a shield. I couldn’t look away from the life and death struggles taking place next to me, which meant I wasn’t paying nearly enough attention to where I was driving. When I felt a bump and the car tilted slightly to the left, I snapped my eyes forward and saw that I had veered to the right and was half driving on the grass verge that paralleled the sidewalk. Not ten feet ahead, the thick trunk of a tree loomed. I gunned the accelerator, aimed for the tree, and at the last second turned the wheel a fraction to the left. The car narrowly missed colliding with the tree. The killer robot hanging onto the side of the car was not so lucky. He was knocked off and left like so much garbage on the side of the road. The last I saw of him in my mirror, he tried to stand up but his crushed legs wouldn’t support him. Tumble and Guppy were unharmed except for the damage to their weapons. They congratulated me on my quick thinking, and I didn’t disabuse them of the notion that it had been my plan all along. I followed Guppy’s directions until we pulled up to where the road ended in another wall. “It’s on foot from here,” he said, still holding on to his broken club. For his part, Tumble inspected the wreck of his gun and threw it to the ground. We followed Guppy along the wall until, in the middle of someone’s backyard, we reached an unassuming door set into the wall. Once we went through, he locked it with the spin of a wheel set into the door. “This way,” he said, leading us through a maze of industrial-looking hallways. There must have been some sort of heavy machinery nearby, because we had to talk over a loud thrumming noise the entire way. I considered splitting off from Guppy now that we had escaped Clinkerville, but I hoped that maybe Guppy’s friends knew of another way Up, one that didn’t lead into worse danger this time. I told Guppy we’d stick with him for now and he shrugged like he couldn’t care less. We walked for over an hour until Guppy found the door he wanted. He knocked out a code and a series of knocks came back. Guppy rapped out a reply and the door opened a crack. “Who you got with you?” came a suspicious voice. The door opened the rest of the way and revealed a bald-headed hulk of a man in ratty-looking, sweat-stained clothing. His neck was massive and he wore a leather necklace around it that fell under his once-white shirt. I thought that if he flexed, the string would surely snap. “Any friends of Guppy’s are friends of mine and all that,” said Crow, waving us in and closing the door behind us. I guess Guppy wasn’t lying about his name, after all, I thought as we walked down a short hallway and into a room set up with some cots and a table. Two men were sitting at the table playing cards, while on one of the cots a large, brown dog lay sleeping under a blanket. Like our thick-necked greeter, the card players also looked worse for the wear, as if they had been cooped up in this room for days. It smelled like it, too, a sweaty musk that teased at my memories. That’s when I saw that the guys playing cards also wore necklaces, with familiar oval pendants hanging from them. My throat constricted and I made a gasping “Urk!” sound. It felt like someone had gripped my heart and squeezed it tight. My blood turned to ice in my veins. It wasn’t a dog, after all. It was a werewolf. They were all werewolves. 12/2/12 News: I successfully used NaNoWriMo as motivation to write the rest of The Only City Left. Parts 43-90 ended up being about 58,000 words, but that is all first draft and the final number may change. Now, of course, I need to get to editing, since at a minimum I need to have Part 43 ready to post by next Sunday. My goal is actually to have it all edited by the end of December, and then start work on converting the serial to a novel format. If all goes according to plan, it will be available as an e-book months before the free, serialized version is completed. Thanks for reading! 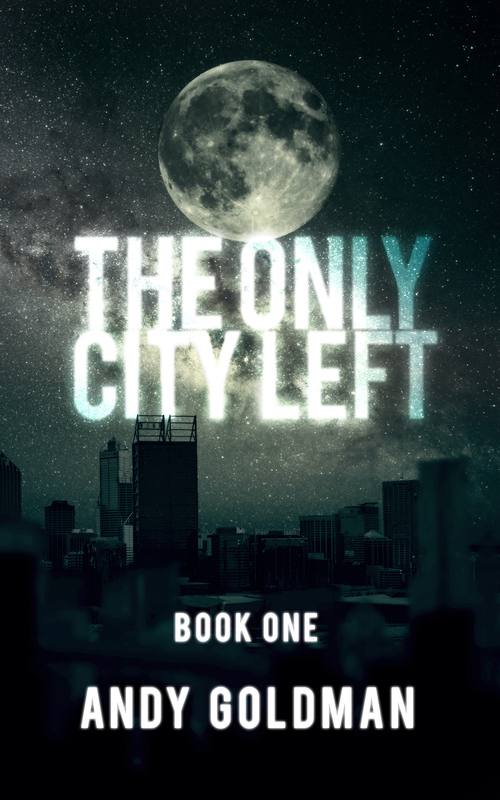 The Only City Left is now listed on the Web Fiction Guide, a wonderful place to find all sorts of online fiction. If you are so inclined, I would appreciate any ratings/reviews/recommends on that site to help get TOCL noticed. Thanks!